Scale - 1:24. Condition - Clean model. Signed Limited Edition. 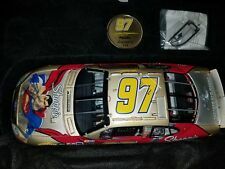 2004 This is a SIGNED by Kurt Busch diecast SUPERMAN, 97, Kurt Bush, pearl owner's linited edition This is diecast number 518 of 756 This one of the diecasts from my large collection. I personally waited in lines to get them signed by Kurt. This item is in great condition. Usually pearl once get dark if displayed on the light. This one was kept in the box (like my other diecasts) Hope you will enjoy it. THIS IS THE ARC VERSION WITH THE UPGRADES A LIMITED EDITION PRODUCED. THESE ARE SERIALIZED AS WELL THIS ONE IS # 513. THIS IS A HISTORICAL RACING PIECE FOR JOHN FORCE AS HE USED THIS BODY IN THE T/F VS FC NO BULL ALL STAR RACE IN BRISTOL IN 1999 WHICH HE WON. Your Buying- A 1/24 Action Brookfield Truck & 2 wheel Trailer Superman Show set. 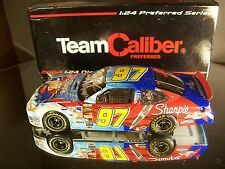 Rare #97 Kurt Busch Sharpie / Superman / Autographed Ford Taurus. Team Caliber put these out in 2004 with a production run of. Keep in mind that when I talk about the condition of the boxes, sleeves or the car that we do not believe that there is a flawless car out there. The car is Mint in Box and gorgeous condition all around, see the photos. Item is excellent. Hot Wheels Monster Jam 1/24 ScaleMOHAWK WARRIOR 2014 EDITION for your Big Ones Collection. THE ORIGINAL Great Gift Idea. The car is Mint in Box and Unopened, gorgeous condition all around, see the photos. 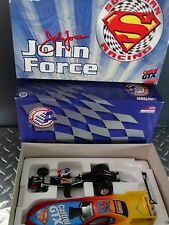 1999 Action/RCCA Limited Edition Funny Car 1:24 John Force/Castrol GTX Superman. Ford Mustang Funny Car. NHRA Diecast Collectible produced by Action Performance John Force raced this car during the 1999 Winston Drag Racing Series. ( Box 296 SB). Florida Residence see above NOTICE . The diecast pictured is the one you will receive. Box may have Normal shelf wear. NO EXCEPTIONS. We reserve all Rights.